Faster, Higher is a multi-screen installation commissioned by Film and Video Umbrella and the British Film Institute. Staged as a solo show at BFI Southbank to coincide with the Beijing Olympics and act as an imaginative precursor to London 2012, the work was also exhibited at the Hatton Gallery, Newcastle, in Hit The Ground (2009), as part of the Great North Run cultural programme. A further solo staging coinciding will take place at The Gallery, Winchester Discovery Centre (2012). The work incorporates montages of Olympic archive material and rarely-seen Chinese documentary footage spanning the last century, with original footage shot near the London 2012 site. Despite China’s voluntary self-exclusion from the Games over three decades, and the avowed apolitical idealism of the latter as a global brand, Faster, Higher finds resonances and commonalities in the visual and cultural rhetoric around notions of nation, sport, patriotism and physical endeavour. New footage shot at the London Wushu Academy points to the mixed cultural identifications of young British athletes today, with martial arts serving as a (Chinese) national, internationally popular, and yet-to-be recognised Olympics sport. Opening with the rituals and symbols of state ceremony and international unity, flags jostle along a succession of parades, punctuated by the release of doves and balloons. Colour bars and countdowns signal a different ‘universal’, implicating the entwined histories of the Games and the moving image, while alluding to archival points of entry. The Olympic rings are echoed through clocks, archers’ targets, lassoes, and gymnasts’ hoops, while the ascent of pole-vaulters, mountaineers, balloons and lanterns invoke the movement’s motto: citius, altius, fortius. Meanwhile, the 2012 site is rendered paradoxically visible and invisible via its blue perimeter: a literal and metaphorical screen, barrier and defence, against which dreams may be projected, protests erased, and the labour behind the spectacle concealed. Accompanying artist's book published by Film and Video Umbrella, 2009 and edited by susan pui san lok and Nina Ernst, with original essays by Chris Berry and Adrian Rifkin. The book features extensive documentation of the artist’s installation at BFI Southbank Gallery (29 May – 30 August 2008), reproductions of Olympic archive and rarely seen Chinese documentary material, as well as stills from new footage shot on various locations in London, including the London Wushu Academy in Leytonstone, and the perimeter of the 2012 Olympic site. The book expands critically on the work and its themes relating to sporting endeavour, national and cultural identity, Chinese cinematic and contemporary moving image discourses, through two original essays commissioned from Chris Berry (Professor of Film and Television Studies, Goldsmiths, University of London) and Adrian Rifkin (Professor of Art Writing, Goldsmiths, University of London). Berry’s essay, ‘States of Play’, considers the work in contrast to key Chinese films, as a ‘heterotopia of a heterotopia’, reflecting distinctions between sport and play, deconstructing the rehearsal and staging of Britain and especially China as modern Olympic nation states, and the Olympics itself as an endless process of de-territorialisation and re-territorialisation. Rifkin’s essay, ‘Altius, Lentius’ offers a reflexive, close reading of the work and its aesthetic and conceptual tactics. The text’s poetical, fragmented form considers and evokes the mediation, manipulation and re-presentation of archival Olympic and Chinese documentary material in the work, and the disjunctive, absorbing encounters and questions produced by its interrogation and play on the historic values condensed in its motto, citius, altius, fortius. Published by Film and Video Umbrella, 116pp, full-colour, soft-cover limited edition of 1000, in a hardback box, ISBN 978-1-904270-29-4. 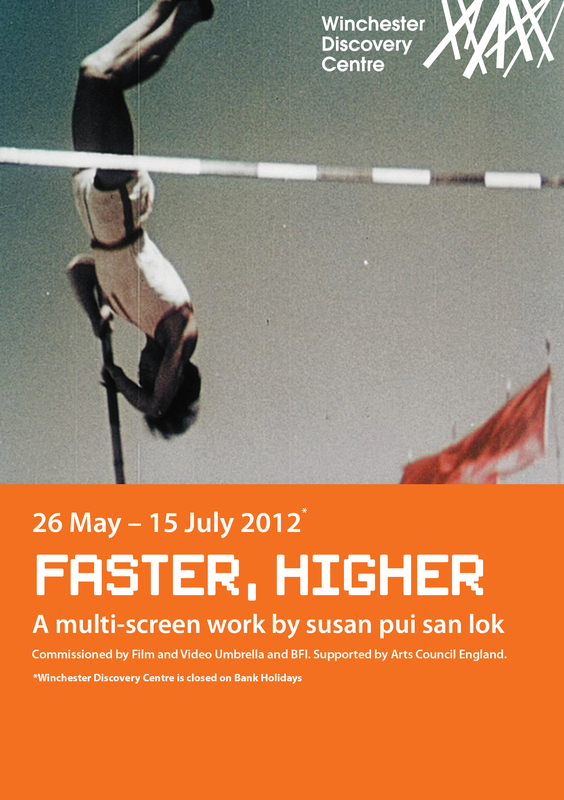 Faster, Higher also featured in The BFI Gallery Book, ed. Elisabetta Fabrizi, as one of 18 exhibitions presented between 2007 and 2010. London: BFI, 2011:75-84, 296pp, full colour, ISBN 978-1-870282-82-6. A new single-channel version of Faster, Higher, called Citius, Altius, was commissioned by SUUM Project for the Samsung IOC New Media Art Collection in 2012, and screened at De La Warr Pavilion and Holden Gallery, Manchester University, as part of AND (Abandon Normal Devices) Festival 2012. Faster, Higher includes material which is copyright Olympic Television Archive Bureau (OTAB), copyright Jim Shum and copyright ITN Source. Original footage copyright susan pui san lok. BFI installation photography by Dave Morgan.